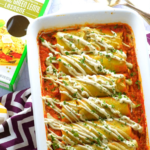 Dish Reviews – Get Cooking! The links in this post are affiliate links, meaning I earn a small amount when you click through and make a purchase. This (of course) costs you nothing extra – it simply allows me to support my cat in the lifestyle they’ve become accustomed to! 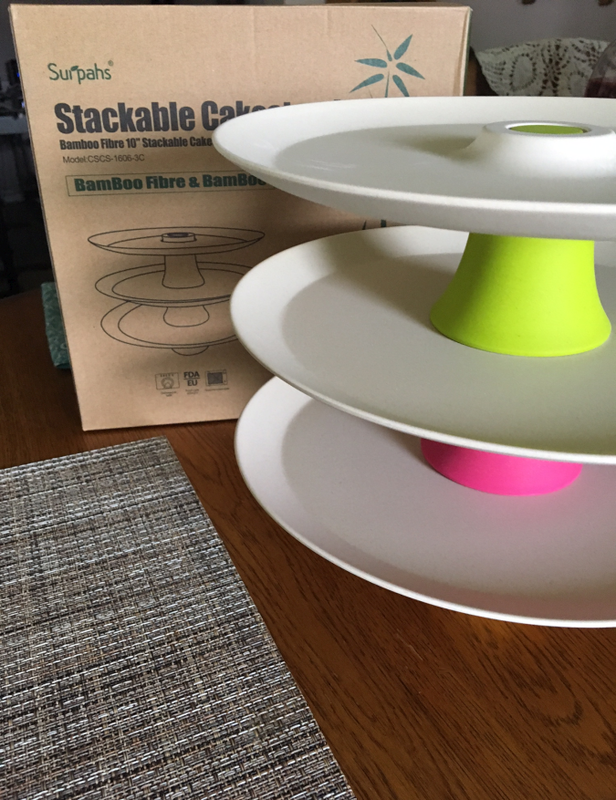 One of my favorite things about having a food blog (or any of my blogs, for that matter) is the opportunity I have to review great cookbooks, food, kitchen gadgets, pots, pans, or brilliant beauties like the colorful Surpahs 10-Inch Stackable Cake Stand pictured here. When I was contacted about receiving one of these stands in exchange for telling you about it, I wasn’t entirely sure what to expect. I mean, it was obviously beautiful in the pictures sent to me. I’m full-on wild about colorful, out of the ordinary, and whimsical things,and I could tell (from the pictures alone) that this colorful cake stand was something I’d love. However, I had no idea that it would be as gorgeous as it is in person. There’s an exceptionally, unmistakably “high quality” to these pieces that pictures, alone can’t possibly pick up. Speaking of pictures – this cake stand was a particular challenge for me! I LOVE taking pictures of things I’m sent to review and take great pains to “set up” the right atmosphere, lighting, etc – everything I think will showcase it to its fullest. With this cake stand, I found myself kind of flustered because there’s just no way to show you how beautiful it is! Trust me, I tried every angle, but it’s “in person” beauty far surpasses its “in photograph” beauty. The quality you see in person simply can’t be completely appreciated in pictures. Kind of like a sunset, a sailboat on a lake, or a deer eating leaves from a tree. The camera can only do so much. This six piece set can be stacked together to create a beautiful display for cupcakes, cookies, slices of cake, dipped strawberries… just about anything you can think of. You could also use it as three separate colorful serving platters. They’re perfect for hamburger or taco bars or for “extras” when serving salads… you know, those components that some members of the family like, while others look at you like, “You can’t possibly think I’m going to eat that…” In our family, these foods include olives, cilantro, bacon bits, and onions. The thing that makes this set so uncommonly beautiful is the new material, Bamboo Fiber. In addition to looking fantastic, the bamboo fiber is also biodegradable, eco-friendly, and dishwasher safe. Two words that are always music to my ears – dishwasher safe. 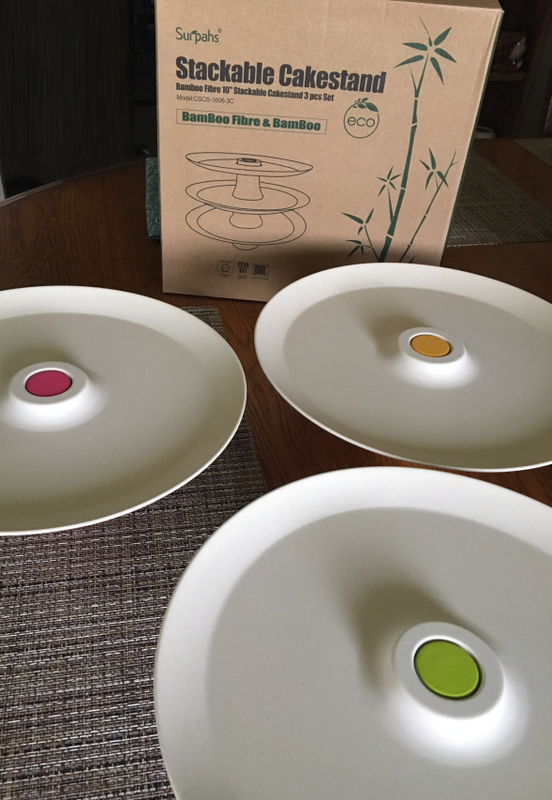 Most stands pre-determine which plate goes on top because they’re various sizes (and the smallest gets top billing), but, since these are all the same size, you decide which color you want on top – orange, green, or pink. Naturally, this can change each time you use them. Ahhh, the freedom of expression! I am crazy about these stands (I say stands because I tend to think of this set as five different stands – three individuals, a 3-tier and a 2-tier, when one takes the night off). Not only are they gorgeous on your table when in use, they’re gorgeous sitting on a shelf or hutch when not in use. 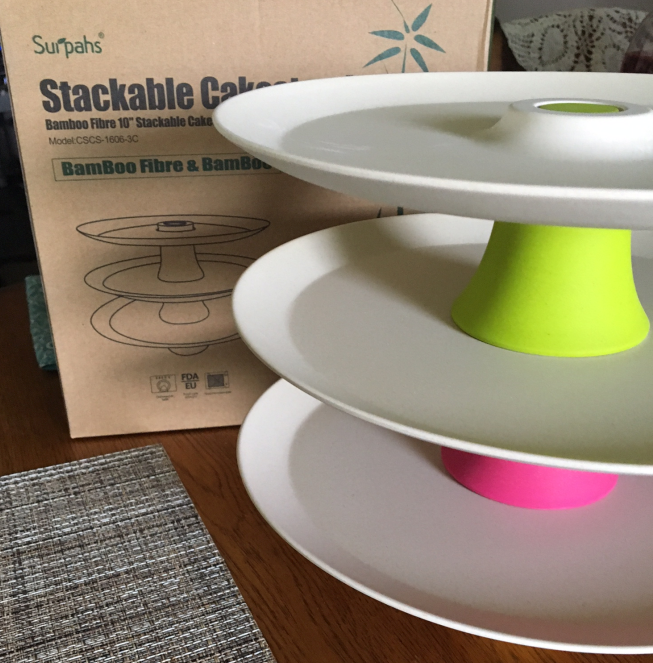 See Surpahs 10-Inch Stackable Cake Stand for more information. Their price on Amazon is unbelievably low – meaning you can scarf one for yourself AND one or two for gift-giving. These are phenomenal. I recently had the great pleasure of selecting a couple of Infinity Jars to review on my food blog and tea blog (Crazy Tea Chick). As soon as I saw their gorgeous collection of premium glass jars and containers, I knew the decision process was going to be a pain-staking one. I honestly wanted everything I saw! It reminded me of walking into a a Japanese restaurant… what do I NOT want!?! Infinity Jars features the largest collection of ultraviolet glass products you’ll find anywhere. Their unique jars, containers, and bottles are created and backed by scientists and health advocates around the world. Extensive research has gone into each product. 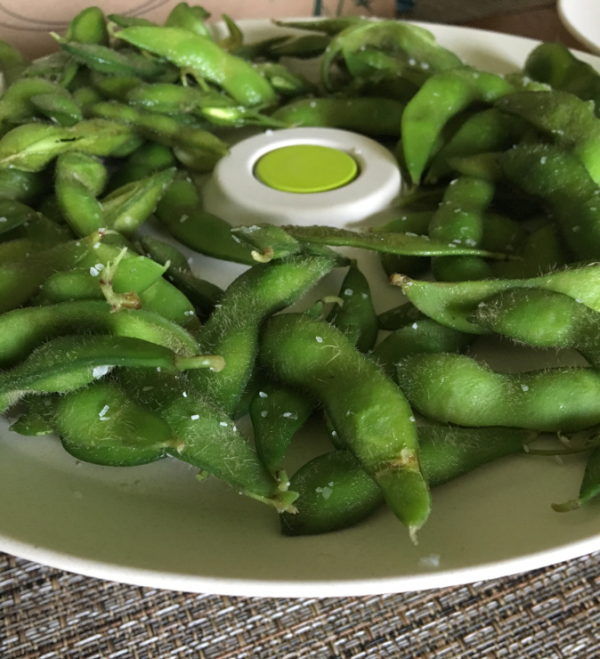 Not only does each container maintain the optimum freshness of nearly any food, dried good, lotion, or essential oil…. they look gorgeous going about their business. The heavy duty jars are of the highest quality – and this truth rings home as soon as you hold one. These aren’t the food or herb containers you find in your local department stores – this are the type of containers celebrity chefs would have in their own kitchens. The first jar I decided upon was the gorgeous Infinity Jar Glass Dish with Lid, pictured at the top. 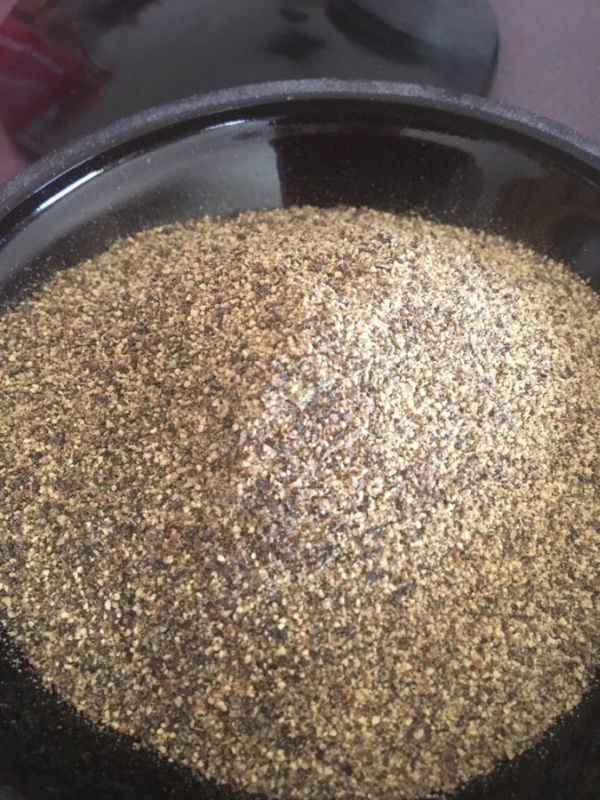 Not only is it uncommonly beautiful, I wanted to use it for “pinchable” black pepper and spice blends. There’s just something about “pinching” the spices you want to use when cooking. 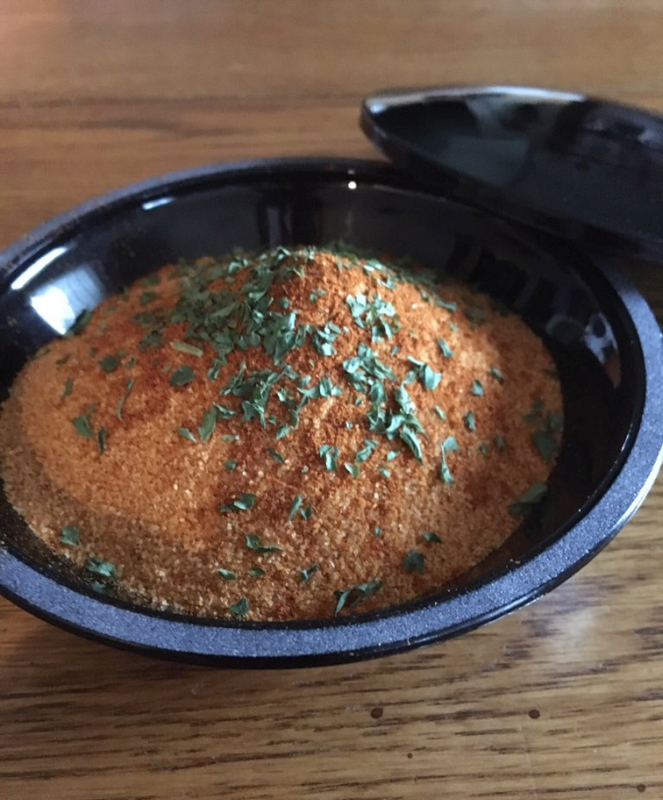 In the picture above, I had a blend I use daily (seasoned salt, paprika, parsley, and garlic powder). It makes cooking faster and even funner to keep these “pinchables” handy. I’ve also used it to store dry tea leaves. 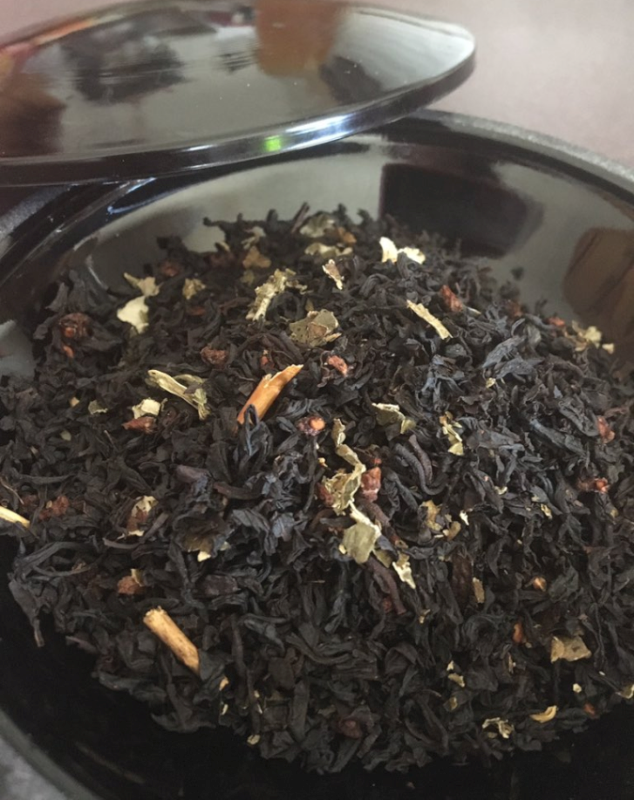 I buy a lot of tea leaves and love to combine them, creating a mixture (for example) of Blood Orange and Vanilla leaves. In the picture below, it was a blend of Raspberry and Peach tea leaves (it was out of this world, by the way). I could also see using the Infinity Jar Glass Dish with Lid for beautiful carved soaps in the bathroom or by the kitchen sink, to hold potpourri, to store cinnamon sticks or dried herbs, or even as a gorgeous dish for softened butter on your holiday table. 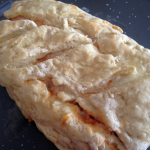 It is simply gorgeous and its uses are many and varied. I also chose the equally gorgeous Long Neck Glass Bottle. 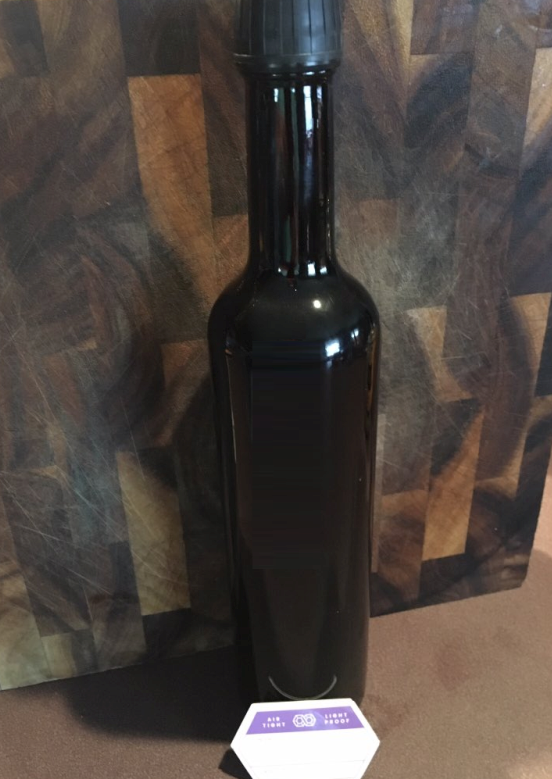 This beauty would be IDEAL for olive oil – or any other kind of oil or vinegar you frequently use, but I have bottles in use already for these kitchen staples. When I selected this bottle, I had one thing in mind, my vinegar-based salad dressing I always have made up… and I mean always. What can I say, we eat a lot of salads in this house. The jars come with a very cool cleaning cloth (pictured above) that keeps them shiny and beautiful. They also come with cool little labels which, quite honestly, I don’t use. The jars are just too darn pretty to mess with, in my opinion. Head over to Infinity Jars to see all of their MANY beautiful products – but pour yourself a tall glass of iced tea first. You’ll be there a while deciding which you want first. 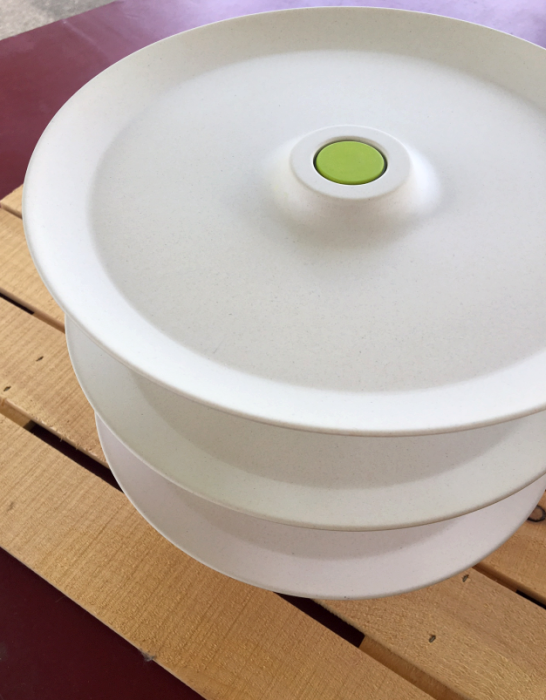 A few weeks ago I was sent a GORGEOUS set of Slimware Ceramic Plates to review on the food blog. It was love at first sight and I’ve only fallen further in love with them each time I’ve used them. Each plate is designed to help you keep healthy portions in mind as you fill your plate. 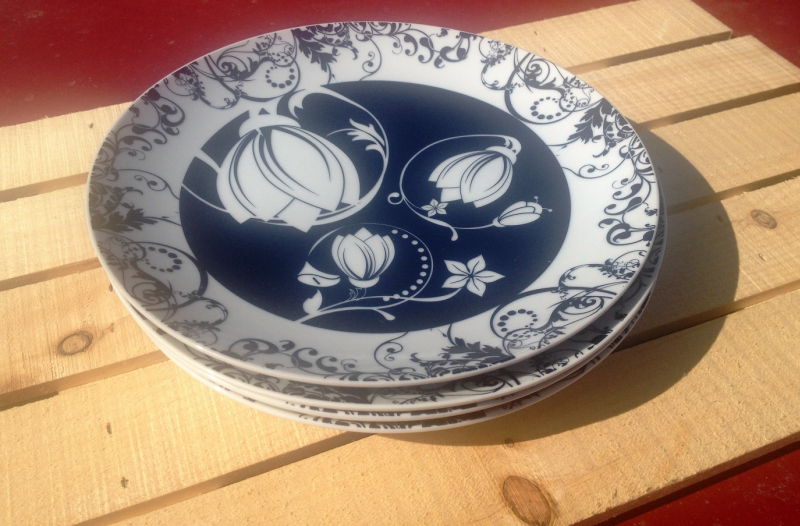 The beautiful plate I was sent is the Bluebelle Slimware plate. Each plate is similarly designed, allowing the plate to be visually divided into four sections, varying in size. In Bluebelle’s case, it’s four flowers. 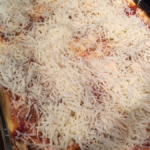 As you can see in the image below, the larger section is for vegetables (understandably enough!). The next largest section is for carbs/side dishes. The smaller sections are for proteins/entrees. I’m absolutely struck by how ingenious these plates are. They take all of the guesswork out of it – encouraging healthier eating while also reminding you to keep portion size in mind. Each Slimware box contains 4 MICROWAVE SAFE ceramic plates. Slimware is a unique line of casual dinnerware with an emphasis on portion consciousness fused with elegant yet convenient dining. Why waste time with the tedious task of counting calories when you can just use your eyes to limit your portions. If you eat less, you’ll weigh less. Slimware will change the way you LOOK at dieting! 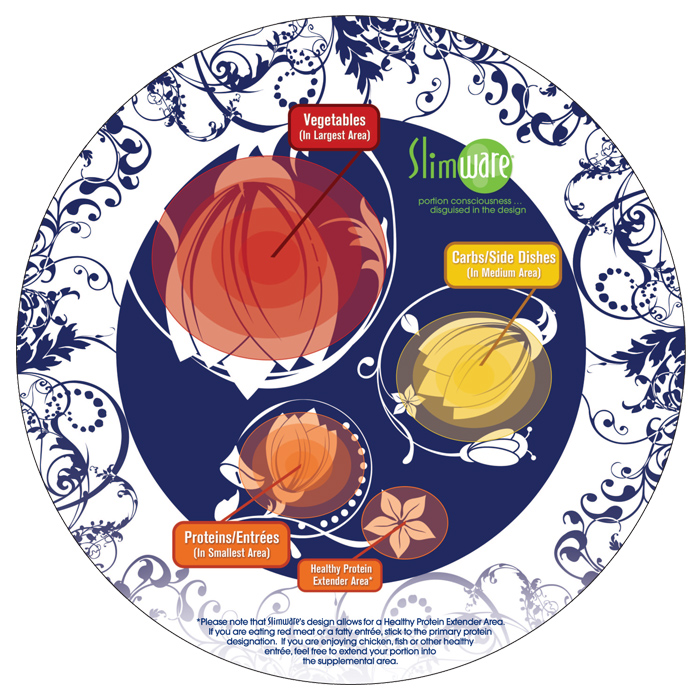 Each plate provides graphically-designed areas for food placement. While I do love and applaud the thinking behind these plates, I’d be lying if I didn’t say that my favorite thing about them is how gorgeous they are. 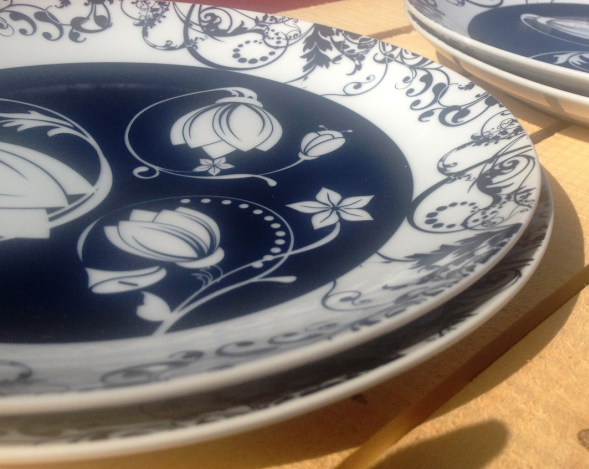 If the others are as beautiful as the Bluebelle dishes (and I’m certain they are! ), you can’t possibly go wrong with ordering any design. When I opened my box, I was immediately struck by how NICE these dishes are – thick, heavy, and very colorful. Everything about them says quality and I actually want more! I noticed on the website that they also have “Measure Up Bowls,” which are also beautiful. 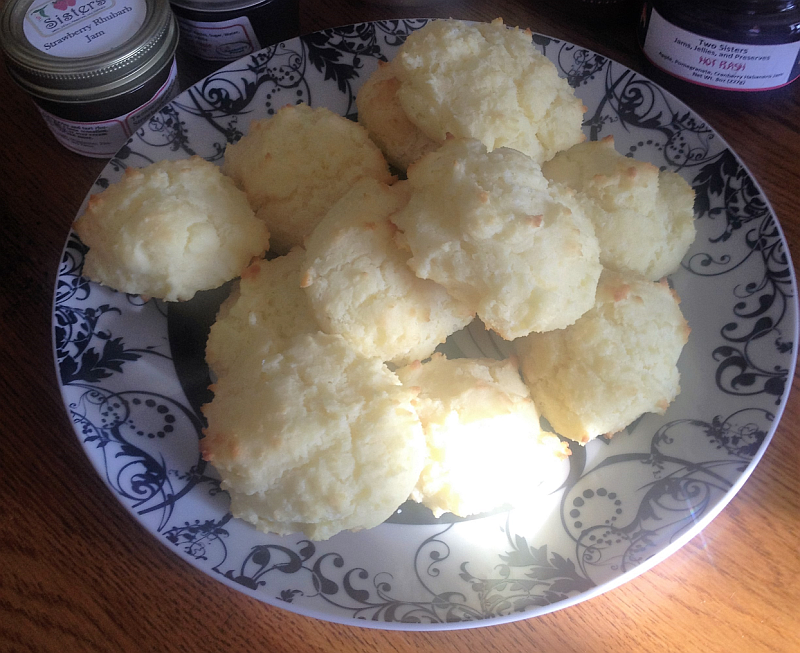 As you can tell from the picture below (gluten free biscuits – YUM! ), I use the plates for more than just portion control – they’re just absolutely gorgeous. 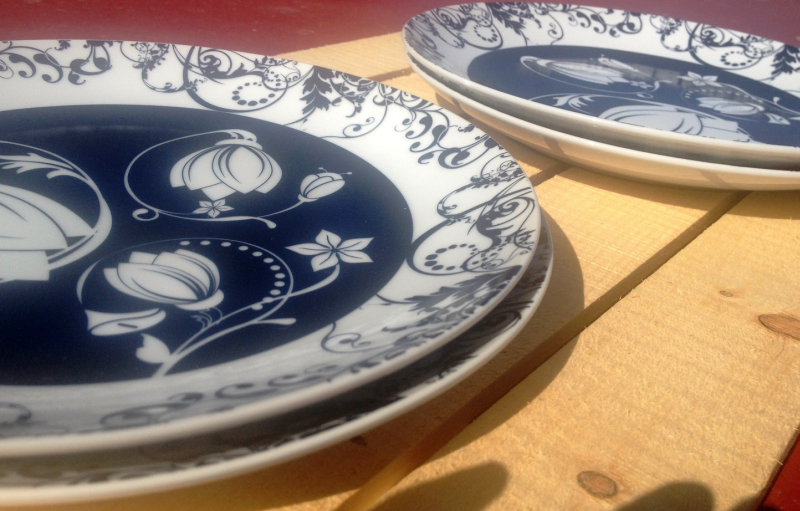 Bluebelle and Dandelion Dreams (white with dandelions) are Microwavable, Ceramic Slimware plates. Slimware also has a line of Melamine Plates which include Urban Safari (leopard print with bold, colorful flowers), Sunburst (bright yellow with white flowers), and Jubilee (red with cherry blossoms). 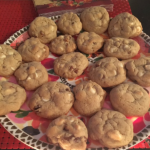 … anyone trying to lose weight. Portion control cannot be emphasized enough! …. Christmas gift – for any adult on your list. 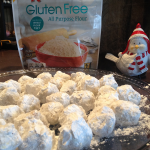 … diabetics. 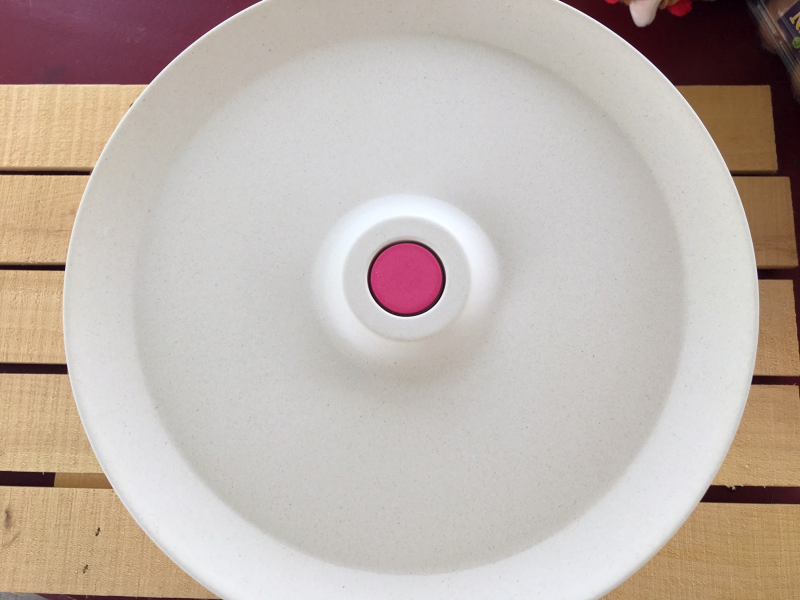 A diabetic has to eat certain amounts of certain foods each day – what better way to measure them out than allowing your plates to do the work for you?! …. anyone on any sort of restrictive diet. 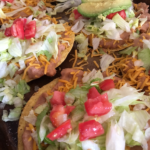 … anyone who loves beautiful dishes! 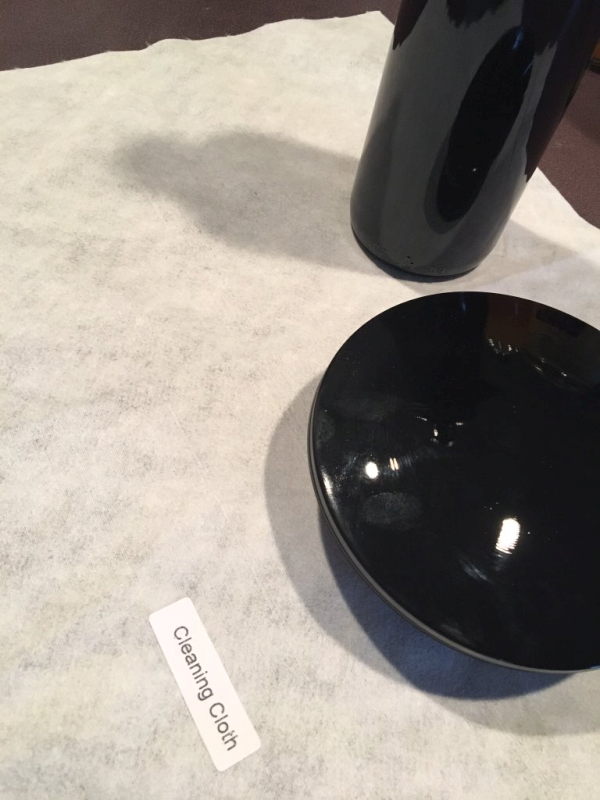 Below is a video that will give you a little more information about these beautiful and innovative plates . See Slimware for more information. You can also find Slimware on Facebook and follow Slimware on Twitter.